Food allergy and anaphylaxis awareness is the focus across many countries during the month of May. It’s a special opportunity to shine a spotlight on the issues that individuals and families that live with food allergies face everyday. We can all help make the world safer for people with food allergies. It’s as simple as sharing personal experiences, educating others about the signs of anaphylaxis and teaching friends and family to wash hands AFTER eating. Here are some other great ideas on how you can help spread awareness and contribute to this important initiative. Get social! Use your social media accounts to spread the word on allergy awareness month. 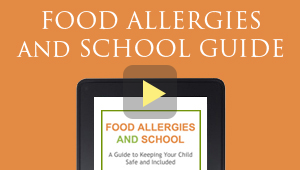 Plan a fundraiser in support of allergy education and awareness initiatives. Adopt an allergy for a day or week to help understand what people with food allergies go through every day.